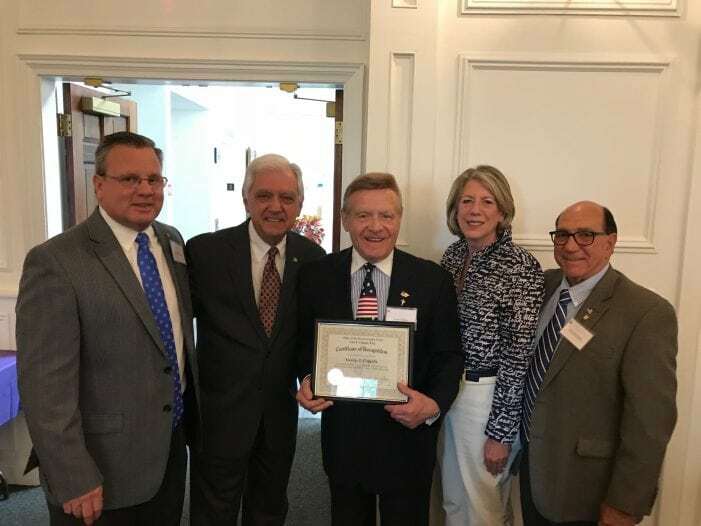 On May 22, Hanover Township resident George Coppola received a “Certificate of Recognition from Morris County Clerk Ann F. Grossi, during the county’s 3 rd Annual “Cissy Laureys” Award and Recognition Ceremony held at the Frelinghuysen Arboretum. Coppola was honored for his outstanding service and commitment to others. In keeping with May’s designation as “Older Americans Month,” the county had been seeking nominees in April who best exemplify the “qualities of compassion, dedication and service to (our) older Americans and physically challenged citizens.” The Hanover Township Committee felt that Coppola was the perfect fit for this recognition and nominated him for an award. Township Board of Education, Coppola invests much of his time advancing the compassionate work of the Knights of Columbus and the Seeing Eye. His volunteer work also supports the Hanover Township Veterans Alliance and Hanover Township’s senior citizens. He currently serves as president of the Hanover Township Senior Citizens’ Club, and a member of both the Landmark Commission and the Cultural Arts Committee.